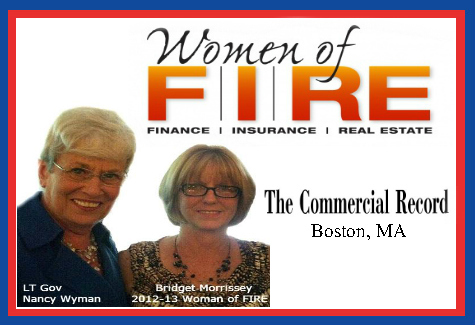 The Commercial Record named its 2012 Women of FIRE honorees, an annual award recognizing the key female players in the local FIRE (Finance, Insurance and Real Estate) sector. The second annual Women of FIRE award celebrated the best and the brightest women in the Connecticut FIRE industry. With the help of Commercial Record readers, a group of judges sorted through dozens of nominations and chose 12 brilliant, innovative leaders to be named Women of FIRE. “We searched for the best of the best – those women who are making a difference through innovation, hard work, team-building, philanthropy, mentoring or leadership – and these women demonstrate these exemplary qualities,” said Timothy M. Warren Jr., CEO of The Warren Group, publisher of The Commercial Record. The September issue of The Commercial Record magazine included profiles of each of the winners. The winners were honored at the 2012 Women of FIRE Awards Luncheon on September 27. Lt. Gov. Nancy Wyman presented the award and gave the keynote speech, proving how determination and perseverance can lead to extraordinary accomplishments. Few people work seven days a week and are able to contribute additional hours to numerous civic activities. Bridget Morrissey, Realtor at Mystic’s RE/MAX Coast and Country, is one of them. Most people would need a strict schedule to be able to do this, but she finds ways to be flexible. Morrissey lives in Ledyard with her husband, Will. Her two sons and their wives live in the area as well, giving her the opportunity to see as much of her five grandchildren as she can. Bridget’s son, Adam Linicus and his wife, Melissa, live in Pawcatuck with their 2-year-old daughter, Payton, and son, Josiah. Her other son, David Linicus, lives in Stonington with his wife, Jessica, and their three boys: Nathan, 9, and 6-year-old twins, Austen and Jake. Although she had her real estate license years ago, she was not able to use it while raising her two sons. Morrissey worked in the insurance business until she decided to make the transition to real estate after getting her license again in 2010. “With the economy the way it was, I thought I might as well go into real estate,” she said. In addition to her work as a real estate agent, Morrissey is the founder and CEO of Mystic Shore Financial Group, which is licensed for health and life insurance. Mystic Shore represents Anthem, Aetna, and Connecticare and is affiliated with The Chamber Insurance Trust. Prior to entering the insurance business, Morrissey was the owner of Bridget’s Aerobix Plus for several tears, with locations in Groton and Westerly, R.I.
Morrissey is also involved in numerous civic activities in the area, including the Celts & Currachs Festival in New London, Business Before Hours and the Greater Mystic Chamber of Commerce. A member of St. Mary Star of the Sea Church in New London, Morrissey is the facilitator of the Crown Ministries Program, helping students learn financial responsibility, and serves as a Eucharistic Minister and group leader in the Disciples in Mission Program. Morrissey ministers a program for the female inmates at York Correctional Facility in Niantic.